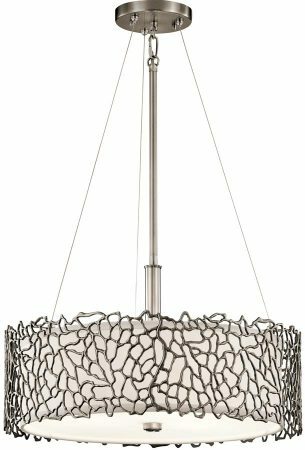 The Kichler Silver Coral 3 light duo mount pendant ceiling light in antique pewter finish is contemporary and inspired by natural coral. This collection evokes a natural feeling while providing endless and fascinating features. Delicate details are infused with a unique contemporary yet soft design. Superb quality three light dual mount ceiling pendant, suspended from three wires and central lamp support rod. The 46cm shade houses the three lamps and is finished in a white fabric, with the outer rim overlaid with classic pewter finish coral-like decoration. The bottom of the shade is fitted with an etched glass diffuser for a softer mellow light. Supplied with two 15cm and two 30cm rods that can be used indivdually or in any combination for flexibility at the time of installation. Minimum height 29cm, maximum drop 127cm. Shade height 17.5cm. 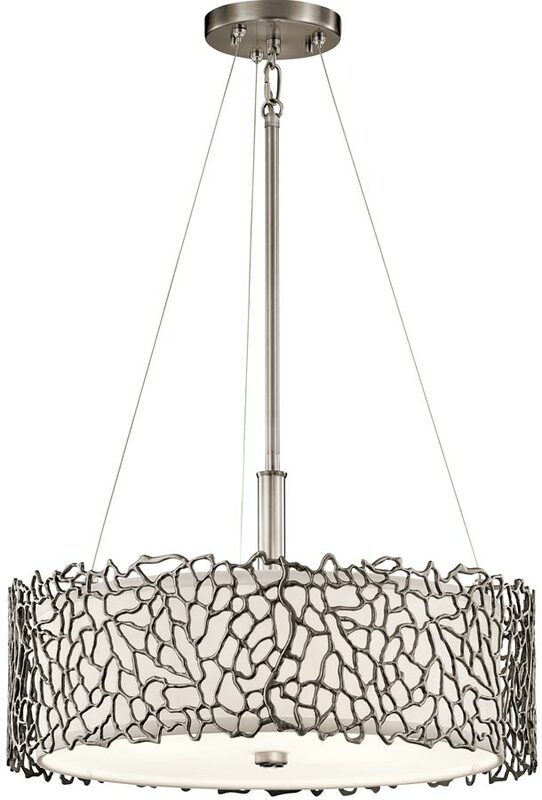 Can be mounted as a semi-flush ceiling light for rooms with limited ceiling height, as shown in the additional images or as a full drop pendant for rooms with a generous ceiling height. A modern, sophisticated design offering the ultimate in urban chic, inspired by natural coral that evokes a feeling of nature whilst providing endless and fascinating features. A unique contemporary yet soft design. 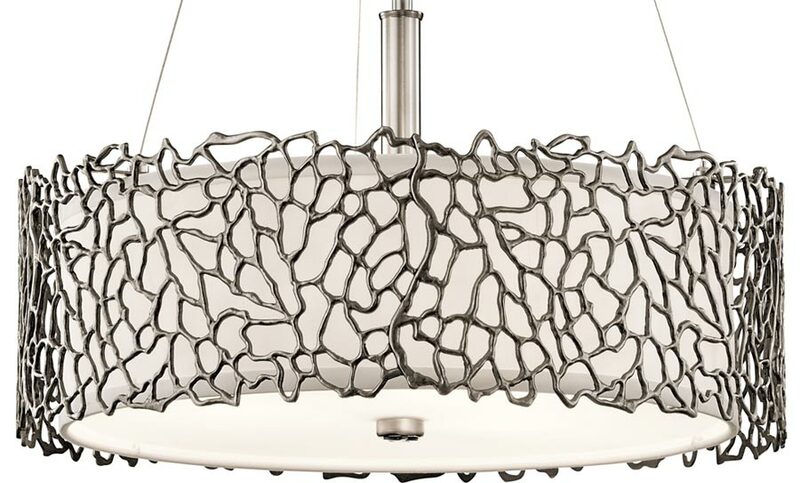 Other fittings in the Silver Coral contemporary lighting suite can be viewed below and includes three different sized ceiling lights and a wall light. Designed in the USA by Kichler, founded in Cleveland Ohio in 1938. L.D. 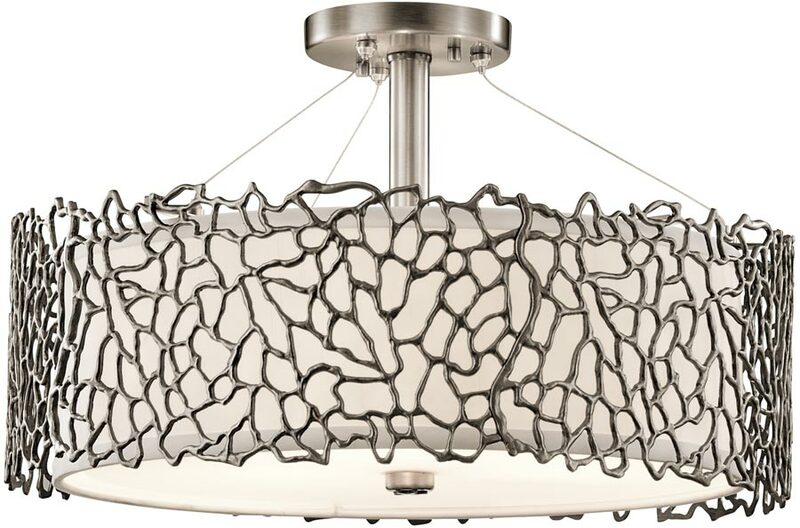 Kichler & Co. is a family run business held in high regard for their diversity of design and breadth of range, which includes some truly striking contemporary and substantial light fittings like the Silver Coral 3 light duo mount pendant ceiling light in antique pewter finish featured here.